A high quality patent search helps to determine if your product innovations and industrial designs are patentable and is essential for crafting superior patent applications. 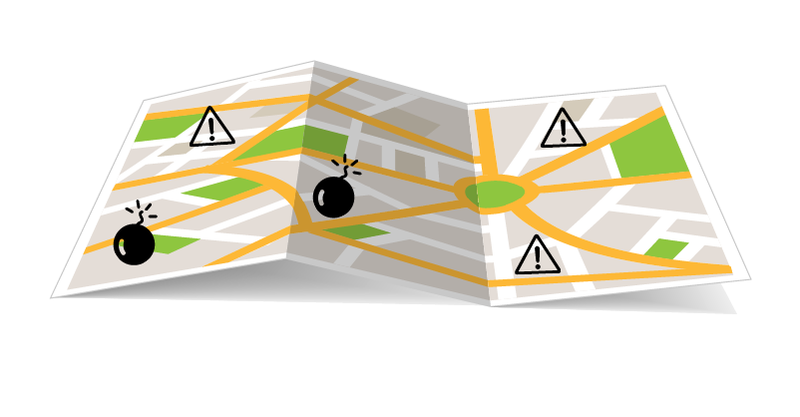 Writing and prosecuting a patent application without a search is like walking through a minefield without a map. You are blind to what lies underneath the surface, waiting to destroy the time, money, and work you invested in the patent process. A quality patent search gives you visibility. It helps you clearly see the boundaries of your patent. It gives you the knowledge to ultimately decide whether your product innovation can be protected. In this article, you will learn how patent searches can be effective tools for protecting your product innovations and industrial designs. Sometimes a patent search reveals that the original concept is clearly not patentable, or may possibility be patentable but in crowded field with considerable risk. As with most business decisions, deciding whether to invest in the patent process comes down to risk and reward. The information revealed in a well-executed patent search helps you understand the risk and lets you make an informed decision. You may be thinking,”I am an expert in my field, I know my competition, I haven’t seen anything like this product.” “This invention is completely unique.” While this may all be true, you would be surprised what a patent search will turn up. Many of my clients are experts in their fields. They know their market and their competitor’s products. I make it my business to understand my client’s business and after working with them a while, I gain a good understanding of their market and the patent landscape. Yet, a patent search often brings to light unexpected information that neither I nor my client expected. Knowing this information in advance, prevented them from wasting time and money chasing something that is not patentable. Knowing this information in advance often helped hone in on what was worth patenting and what was not. What Makes a Quality Patent Search? Not all patent searches are created equal. Let’s explore what makes a quality patent search. The patent search should include an analysis and legal opinion. The main purpose of the patent search is equip you with the information necessary to decide whether to invest company resources in the patent process. A good patent search analyzes the most closely related references. The analysis should be clear. It should point out the relevance of each reference. The analysis should define the boundaries of what may be patentable and what is not patentable. The legal opinion should clearly state what the patent attorney or agent believes may be patentable, what is not patentable, and state the risk. Only a patent agent or patent attorney is licensed to give a legal opinion as to whether they believe something is patentable or not. The patent search should be broad and thorough. The patent search should span as many countries as possible, not just the United States. In my experience, relevant patents can come from anywhere in the world. For patents based in the mechanical arts, the patent search should go back far as possible. I have personally uncovered relevant patents in the mechanical arts dating from the mid to late 1800s. A patent search should be based on both keywords and patent classifications. Before computers, paper copies of the U.S. patents were organized using a complex filing system. This system is known as patent classifications .Patents were classified by broad subject or “classes” such as apparel, tools, printing, and so on. Each class was drilled down further into sub-classes. Other countries had their own classification system. With the advent of computers, patents were scanned and the texted extracted to allow for keyword-based patent searches. While keyword-based patent searching is very convenient, it is not perfect and may miss important relevant documents. Experienced patent search professionals will supplement their keyword-based searches with a computer based classification search. The U.S. Patent and Trademark Office and many foreign patent authorities require their examiners to do a computer based classification search. A search professional familiar with U.S. patent law should ideally conduct the patent search. The person doing the patent search should thoroughly understand the criteria a patent examiner will use to determine patentability. Generally, a person best suited to understand this is either a former patent examiner, a patent attorney, or a patent agent. The patent searcher needs to be careful to not publicly disclose the inventive concept. A patent search can be done using either private subscription-based patent search databases such as Lexis TotalPatent, Thomspon Innovation, or Questel Orbit or by public databases such as Google patents, or Free Patents Online. Similarly, a public document search can be done using both private and public databases. The public database searches may not be confidential. Therefore, the patent search professional should take great care to not disclose the inventive concept in the keyword string while using a public database. Your patent search should be done in the United States. Many patent attorneys outsource patent searches and patent preparation to other countries. Even though the practice is quite rampant, outsourcing a patent search in preparation of filing a U.S. patent application, without clearance from the Bureau of Industry and Security, is a violation of information export laws. Worse, there is no guarantee of confidentiality. For a great article on the topic, read this article on IP Watchdog about patent search and patent preparation information export laws. I do my own patent searches. For really challenging cases, or for patent searches required for submission for the 12 month accelerated examination program, I may enlist the help of an old friend and trusted colleague, Lin Crampton, to act as a second set of eyes. Lin is also a patent agent and is a former PCT examiner. A quality patent search takes time. I typically spend 15-20 hours conducting a patent search, preparing the report, doing the analysis, and writing a legal opinion. I believe this is what it takes to conduct a thorough patent search. I use a subscription-based patent search database from Lexis called TotalPatent® . One of the reasons I chose TotalPatent® was because they claim to have the largest patent search database in the world. TotalPatent® offers full text searching of patents and patent applications from over 30 countries. In addition TotalPatent® offers bibliographic and abstract searching of over 100 countries. TotalPatent® has one of the deepest collections. Included are full text of US patents dating from the 1830s as well as full text of British, German, Finish, and Swiss patents from the mid to late 1800s. This is very helpful when searching mechanical and apparel related inventions. One great advantage of a private subscription-based patent search database is that the search strings are confidential so I am free to search without being concerned about revealing the inventive concept publicly. I do both keyword and patent classification searching. I use both the traditional US patent classifications and the new international CPC classification. My patent search includes in-depth searching of non-patent literature. Depending on the inventive concept, this may include searching trade journals, magazines, doctoral thesis, academic journals, and the Internet. Again, depending on the subject matter, this may include Gale (InfoTrac) Databases, ABI/INFORM Trade and Industry journals, EBSCO Academic Search Premier, Google, Google Scholar, IEEE Xplore, Audio Engineering Society, Dspace@MIT, Registry of Open Access Repositories, and Networked Digital Library of Theses and Dissertations (NDLTD). Many of these are open public databases. For that reason, I pay close attention to my search terms to make sure I do not reveal the inventive concept of the patent search. My patent search report includes a clear legal opinion and detailed analysis. The legal opinion will tell you whether I believe the inventive concept is patentable. I will tell you if I believe there is substantial risk because the inventive concept sits in a crowded field. If I believe that the inventive concept is not patentable, but a sub-set or more restricted version might be patentable, I will state what I believe may be patentable. My goal is to give you an opinion that helps you make an informed business decision and understand the risk involved in moving ahead. The analysis includes a matrix chart where each element of the inventive concept is compared against the most relevant references. This shows you at a glance how unique the inventive concept is, and if it is vulnerable to a novelty rejection or an obviousness rejection. Interested in a Patent Search? Call toll-free: (877) 707-1572 anywhere in the U.S. to discuss your patent search needs.